29 December 2015 - Mowed western section of woodland. Lopped 2 hawthorns and ringbarked 1 in area south of trail. Pulled a few hawthorns, desert ash west of billabong. Cut back shoots of desert ash poisoned on 16/10. 2 hrs. work. 22 December 2015 - Mowed north section of golf course triangle, part of north-west of woodland - until mower got flat tyre. Spread truck load of mulch around the top bank near shipping container. 2 hrs. work. 16 December 2015 - Mowed south section of golf course triangle. 2 hrs. work. 11 December 2015 - Community work day. Spread 2 ute loads of mulch (with cardboard) north of the track in area planted on 30 August. 7 volunteers - 18 hrs 45m. work. 10 December 2015 - Mowed verges, and picnic area - 1 hrs. work. 3 December 2015 - Slashed woodland south of billabong and blackberries up Chris Cross slope - 2 hrs. work. 29 November 2015 - Community work day. Spread 2 ute loads of mulch (with cardboard) north of the track in area planted on 30 August. 11 volunteers - 36 hrs 10m. work. 26 November 2015 - Slashed woodland south of billabong near MW fence - 2 hrs. work. 14 November 2015 - Slashed woodland south of billabong and spread a ute load of mulch (with cardboard) near southern signboard - 4 hrs. work. 13 November 2015 - Community work day. Spread 2 ute loads of mulch (with cardboard) north of the track in area planted on 30 August. 7 volunteers - 22 hrs 15m. work. 11 November 2015 - Slashed track verge and below shipping container (with whippersnipper) - 1 hrs. work. 8 November 2015 - Slashed picnic area and parking area (with whippersnipper) - 1 hrs. work. 7 November 2015 - Bat check - 1 male banded gould's wattled bat. 25 October 2015 - Community work day. We planted about 25 plants, -3poas (Poa ensiformis), 5 Ruby Saltbush (Enchylaena tormentosa), 5 native raspberry (Rubus parvifolia), 5 basalt daisy(Brachyscome multifida), 5 small leaf clematis (Clematis microphylla), near the path junction - Weeded the culvert area and microlaena area south of the billabong. Spread 2 ute loads of mulch (with cardboard) along the track below the picnic area. 12 volunteers - 42 hrs 40m. work. 16 October 2015 - Mark Douglas (Bushland Recovery), and I removed a large desert ash near the culvert area - 4 hrs. work. 15 October 2015 - RMIT viisit. RMIT 1st year CaLM students visited. - After a tour of the reserve weeded the culvert area and peninsular. approx 10 students - 15 hrs. work. 9 October 2015 - Community work day. We planted about 60 plants, -35 kidney plant (Dichondra repens), 25 Lax goosefoot (Einadia trigonis), along the north side of the path - Weeded the culvert area and peninsular. 6 volunteers - 22 hrs. work. 2 October 2015 - Bat check - 3 Gould's wattled bats & 1 escapee. 1 October 2015 - Lopped and poisoned 10 more hawthorn - 0.5hrs work. 28 September 2015 - Mowed the rest of the golf course triangle and most of the western section of the woodland. - 3hrs work. 27 September 2015 - Community work day. 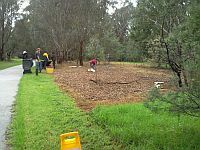 We planted about 40 plants, - 2 pale flax lily (Dianella laevis), 8 Poa (Poa ensiformis), 30 bidgee widgee (Acaena nova-zelandiae), along the south side of the path and in the picnic area. - Mulched and cardboarded along the track west of the picnic area and 2013 & 2015RMIT areas. 6 volunteers - 27.25 hrs. work. tiger snake, blue wrens, red browed finches, magpies, mudlark, pied currawong. 24 September 2015 - Mowed north-east part of the golf course triangle. Lopped and poisoned more small hawthorn and pittosporum in golf course triangle- 2.25hrs work. 21 September 2015 - Lopped and poisoned some hawthorn, and prunus which had escaped previous sessions. - .5 hrs work. 19 September 2015 - Mowed car park area, picnic area, verges and north-west part of the woodland.. - 1hrs work. 17 September 2015 - Collected kapok vine fruit and pulled the roots north of the path. - 2hrs work. 11 September 2015 - Community work day. 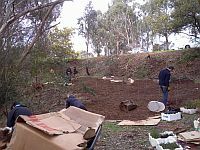 We planted about 400 plants, - 27 tufted bluebell (Wahlenbergia communis), 27 pale flax lily (Dianella laevis), 54 Poa lab(Poa labilliarderei), 54 Poa (Poa ensiformis), 27 gold dust wattle (Acacia acinaceae), 27 Clustered Everlasting (Chrysocephalum semipapposum), 27 Chocolate lily (Arthropodium strictum), 27 large-leaf bush-pea (Pultenaea daphnoides) (a new species to the area), 90 kidney plant (Dichondra repens), 54 basalt daisy (Brachyscome multifida), in the area behind the signboard and in the picnic area. - 12 volunteers from Ruyton Girls School, and 5 regular volunteers - 61.25 hrs. work. 10 September 2015 - Continued slashing between MYT and billabong, mostly fumitory. - 2hrs work. 5 September 2015 - Slashed between MYT and billabong, mostly fumitory. - 1hr work. Bat check - 2 bats in tube 4. 3 September 2015 - Slashed between MYT and billabong, mostly fumitory. - 1.5hr work. 2 September 2015 - Mowed main track verges, picnic area, top level, north of MW track, and eastern woodland. - 2hr work. 30 August 2015 - Community work day. We did a bit more planting in the area to the east of the picnic shelter. We planted another 50 plants in that area; a mixture of Poa (Poa ensiformis), arching Flax-lily (Dianella longifolia), and basalt daisy (Brachyscome multifida). 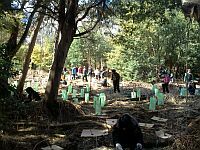 We then planted about 200 (Microlaena stipoides) 'speedlings', and 54 tufted bluebell (Wahlenbergia communis), 54 pale flax lily (Dianella laevis), 200 Poa (Poa ensiformis), 54 snowy daisy bush (Olearia lirata), 54 gold dust wattle (Acacia acinaceae), 54 prickly moses (Acacia verticillata), 54 bidgee widgee (Acaena nova-zelandiae), 75 basalt daisy (Brachyscome multifida), 75 tufted bluebell (Wahlenbergia communis), 54 river bottlebrush (Callistemon sieberi)in the area north of the path. 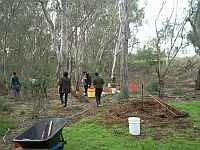 - 14 people from Camberwell Grammar School, 8 from Monash University and Autopia tours and 4 regular volunteers - 107 hrs. work. 26 July 2015 - Community work day. We planted out the area to the east of the picnic shelter, laying cardboard and mulch around the grasses and shrubs. We planted about 200 plants in that area; a mixture of Poa (Poa ensiformis), common correa (Correa reflexa), twiggy daisy bush (Olearia ramulosa), rosemary grevillea (Grevillea rosmarinifolia) (Plenty form), tufted bluebell (Wahlenbergia communis), and basalt daisy (Brachyscome multifida). Gail & I then planted about 300 (Microlaena stipoides) 'speedlings' in the lower areas. - 9 people from Camberwell Grammar School and 6 regular volunteers - 51 hrs. work. 23 July 2015 - Mowed main track verges, and in golf course triangle near fence. - 1hr work. 10 July 2015 - Community work day. 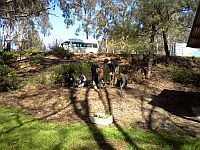 We planted 150 kidney weed (Dichondra repens), 100 poa (Poa ensiformis), 50 bidgee widgee Acaena nova-zelandeae), 50 tufted blue bells (Wahlenbergia communis) 27 forest germander (Teucrium corymbosum) (a new species to Burke Rd. reserve) 27 clustered Everlasting (Chrysacephalum semipapposum - valley form) plants, mostly north of the track between the bridges, but the blue-bells, germander and clustered everlasting spread along the sides of the track. - 13 people - 38h work. 9 July 2015 - Mowed verges, under bridge, picnic area, carpark area. - 1hr work. 28 June 2015 - Community work day. 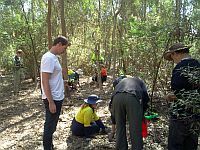 We planted 200 kidney weed (Dichondra repens), 50 poa (Poa ensiformis), 50 bidgee widgee Acaena nova-zelandeae), 40 hop goodenia (Goodenia ovata) plants, mostly along the south side of the track, but about 70 north of the track. - 6 people - 19h20m work. 13 June 2015 - Bat check - 2 male gould's wattled bats in tube 3. 1 new, 1 recapture. 12 June 2015 - Community work day. 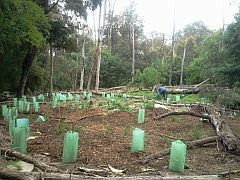 We planted 200 kidney weed (Dichondra repens), 50 poa (Poa ensiformis), 50 bidgee widgee Acaena nova-zelandeae), 50 dianella (Dianella laevis), 50 lax goosefoot (Einadaia trigonis) plants along the south side of the track and weeded north of the track and in RMIT 2014 area. - 10 people 29.5hrs work. 5 June 2015 - Visited Kew golf club and marked weed trees and pulled kapok vine in their south-east corner. - 3hr work. Spread 2 ute loads of mulch on cardboard in north-west corner of woodland. 2 hours work. black cockatoos at picnic area. 31 May 2015 - Community work day. 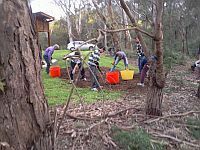 We planted 150 kidney weed (Dichondra repens), 20 Austral indigo (indigofera australis), 70 poa (Poa ensiformis), 50 bidgee widgee Acaena nova-zelandeae), 50 small leaf clematis (Clematis microphylla) plants around and below the picnic areas. - 13 people 35.75hrs work. 28 May 2015 - Mowed verges, under bridge, picnic area, carpark area. - 1hr work. 16 May 2015 - Bat check - 2 male & 1 female Gould's wattled bat in 3 tubes. 1 male recapture. 2 new bats to the colony. 30mins work. 8 May 2015 - Community work day. We planted 180 kidney weed (Dichondra repens), 15 kangaroo apple (solanum laciniatum), 50 gold dust wattle, (Acacia acinaceae), 50 Cut leaf daisy, (Brachyscome multifida), 30 Austral indigo, (indigofera australis), 80 poa (Poa ensiformis) plants around and below the picnic areas. - 10 people 28.25hrs work. 23 April 2015 - Mowed verges, under bridge, picnic area, carpark area and some areas of woodland where the grass was higher than other areas. - 1hr work. 10 April 2015 - Community work day. 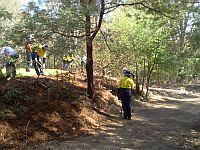 Volunteer numbers were augmented by Boroondara's "Green Army", and we spread about 10 ute loads of mulch along the highest bank, and planted 100 kidney weed (Dichondra repens) plants on the south side of the path between the bridges. blue-tongue lizard, tiger snake, magpies, scrub wrens, red-browed finches, grey fantail, noisy mynah, bronze-wing pigeon, mudlark. kangaroo, grey fantail, noisy mynah, bronze-wing pigeon, mudlark, indian mynahs. 14 February 2015 - Bat box check. 5 bats. 12 February 2015 - Mowed verges, near golf course fence and further into north of golf course triangle. 1 hrs. work. 29 January 2015 - Slashed under kangaroo apple area next to bridge. 1 hr. work. 24 January 2015 - Mowed verges and further into north of golf course triangle. 2 hrs. work. 16 January 2015 - Bat check. 10-12 bats flew out of tube 3 on placing ladder against tree - 1 went to T8. 17 bats (2 escapes) in Tube 9, only 1 being a recapture. 10 (1 escape) in Tube 8, most being recaptures. 15 January 2015 - Grubbed out and cut off half the stumps of cork oak copse (poisoned last April) 3 hrs. work. 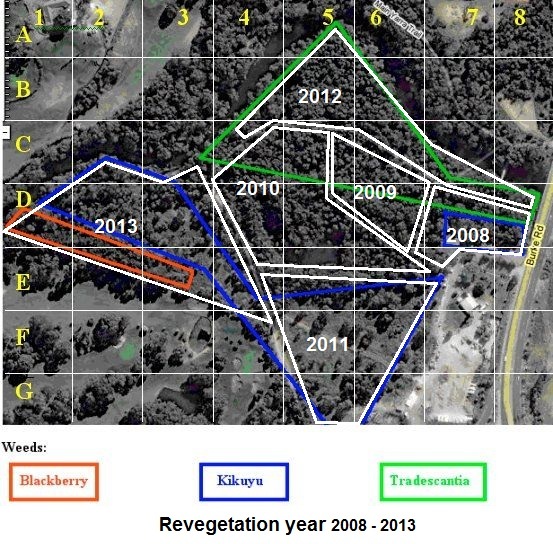 Mark of 'Bushland recovery' sprayed Trad in golf course triangle. 6? hrs work. 12 January 2015 - Replaced exterior ply of notice board with formply; Mowed verges and further into edge of 'ephemeral wetland' south of billabong.2 hrs. work. Mark of 'Bushland recovery' sprayed Trad in golf course triangle. 8 January 2015 - Slashed spear thistle, nightshade and some other weeds in billabong and in golf course triangle; 2 hrs. work. Mark of 'Bushland recovery' sprayed Trad in golf course triangle. 3 hrs work. 5 January 2015 - Mowed southern section of woodland, and golf course triangle south of MW track; 3 hrs. Grubbed spear thistle and ink weed in billabong; 2 hrs. 5 hrs work. Mark of 'Bushland recovery' sprayed north and south of main path. 8 hrs work.